Attempted album rescues inspire both excitement and anguish, satisfaction and sadness. All these emotions and more permeate my thoughts about an old, red velvet-covered album I snatched back from online auction oblivion in 2012. But this is going about the story backwards. It began with the appearance on ebay of a cabinet card photograph of Nora Welty as a child. Having acquired a portrait of the same person as a young woman more than a year before, I was eager to win the auction, and did so. I had already done some family history research on Nora (Welty) Barnheisel (1878-1951), daughter of Fairplay, Md. cabinetmaker David Welty (1832-1916) and Laura A. (Shafer) Welty (1840-1917), so when I noticed a number of other identified Hagerstown-area vintage card photographs up for auction, I quickly realized that the individuals were all part of the same group of linked families from Washington County, whose surnames include Long, Shafer, Coffman, Slifer, Fahrney, Reichard and Middlekauff. The common thread was their connection to Manor Church of the Brethren just south of Hagerstown. According to Jerry Henry’s The History of the Church of the Brethren in Maryland (Elgin, Illinois: Brethren Publishing House, 1936), a group of German Baptists began meeting for services in a structure, possibly a log school house, around 1790, led by Elders David Long and his brother-in-lawn Daniel Reichard. This community eventually became known as the Manor congregation. Manor Church of the Brethren, located off the Sharpsburg Pike between Hagerstown and Antietam battlefield, still exists today. In its large adjoining cemetery rest many of Nora Welty’s ancestors and relations. The anguish of this album for me is that I could not afford to save all the photographs that were removed and auctioned off. Of the 54 slots that, carefully labeled in pencil, appear to have contained photographs, I was only able to save 18 plus two copies of a memorial card for Alexander Shafer. When the empty album came up for sale, I bought it as well. All 18 photographs are now back in their proper places and they and the album will eventually find a home in a public institution in Washington County. But whose album was it? The identifications below the photographs provide clues. Pride of place went to “Uncle David Long my mother’s Brother” and “Aunt Mary Reichard Long,” his wife. 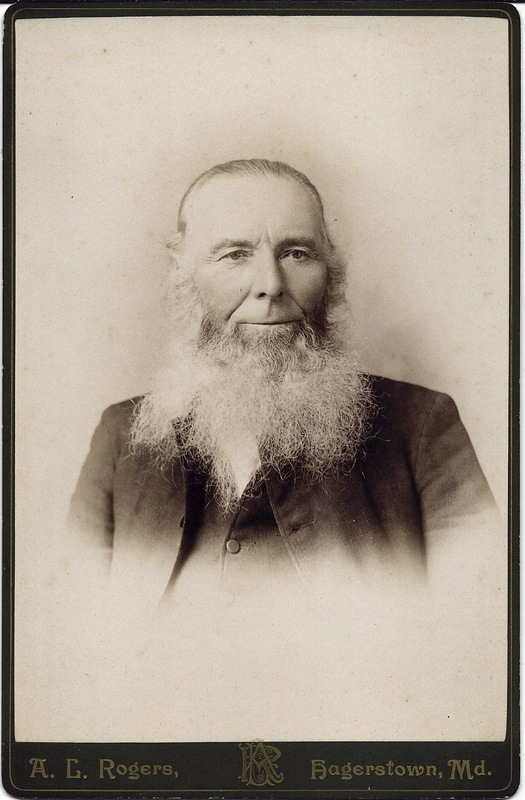 The owner of the album was a niece of David Long (1820-1897) and Mary (Reichard) Long. A few pages further into the album, we see “sister Laura Shafer Welty” (1840-1917), wife of David Welty (1832-1916), Nora Welty’s father, and then “my father Alexander Shafer” (1809-1893). Alexander Shafer’s second wife was Catherine Long (1818-1890), one of Rev. David Long’s siblings. So the owner of the album was one of the four siblings of Laura A. (Shafer) Welty. Another photo is identified as “sister Annie Shafer” (1852-1904). Other siblings were Estella (Shafer) Coffman, Clara Ellen (Shafer) Slifer, and Charles A. Shafer. Alexander Shafer was married twice: Clara, Laura and Charles were his children by his first wife, Leah Sarah Eakle (1816-1848); Annie and and Estella were his children by his second wife, Catherine Long. My money is on Estella (Shafer) Coffman as the original owner of the album. In documenting the people in this venerable, once-cherished album, I begin where the owner began–with Rev. David Long. This later David Long (1820-1897) appears in Henry’s history of the Brethren in Maryland as a revered leader of the Manor congregation. Son of wealthy Washington County farmer and miller Joseph Long (1792-1852) and Nancy Ann Rowland (1791-1865), farmer David Long became an elder at age 25 and then a minister at age 30, presiding over the Manor church for 25 years. Henry relates several anecdotes about David Long to convey his character, including that Long once bought and freed all the slaves at a slave sale. David and Mary Long had 12 children. Joseph, Walter, Orville and Victor became Brethren ministers; three daughters, Susan, Elizabeth and Catherine, married Brethren ministers: Susan married Eli Yourtee; Elizabeth married Emanuel David Kendig; Catherine married Seth F. Myers. By my count, David and Mary Long had 48 grandchildren scattered throughout western Maryland, Pennsylvania, Virginia, Kansas, Missouri and California. The A. L. Rogers studio operator who created this portrait of Rev. Long used the popular vignette style, which burns out the background of the sitter. As I’ve written about in my blog Cardtography, Albert Long Rogers (1853-1934) owned studios in Westminster and Baltimore, Maryland, and Carlisle, Pennsylvania, as well as in Hagerstown. The portrait, taken in Rogers’ Hagerstown location, depicts a full-bearded Rev. Long in his later years, showing many wrinkles, but with eyes still clear and intelligent. His clothing is simple and unadorned, reflecting the back-to-basics values of the Brethren. Thanks to the work of many dedicated volunteers, I have been able to find 99 graves of Longs, Shafers, Weltys, Reichards, Slifers, Fahrneys, Boyds, Eakles and more, on findagrave.com. All 18 portraits I acquired have been posted to their memorials there. The Hathi Trust and Google have made the entire digitized History of the Brethren Church in Maryland available on the web. Thanks so much for doing this research and saving these photos! David Long is my 3rd great-grandfather–his son David Victor had a son named Raymond Victor, who had a son named Raymond Victor Jr., who was my grandfather! Thanks for reading my blog and for the information! May I post to our Western Maryland History Online facebook page, with a link to your blog?